In this work, Weissbort seems to be looking again at the paintings of Melendez (1716-80), in which humble items were rendered heroic – in contrast, for instance, to works by the 17th century Willem Kalf. Kalf painted a few arrangements of kitchen implements, but his preferred subjects were glass goblets, silver platters, chased drinking horns and porcelain. Melendez painted the scullery, rather than the dining, table, and several of his works include the same wooden cheese boxes that Weissbort has depicted here – along with lemons, onions and crumpled linen. The earthy colours and dark tonality of the present painting emphasize the old masterly approach, which is undercut by a diagonal stripe of viridian green around the lid of the gorgonzola box: a sudden, sharp note of chemical modernity, provoking an exciting tension within the picture. The fall of light on the bronze sheen of the onions skins is beautifully observed, as is the texture of the box. 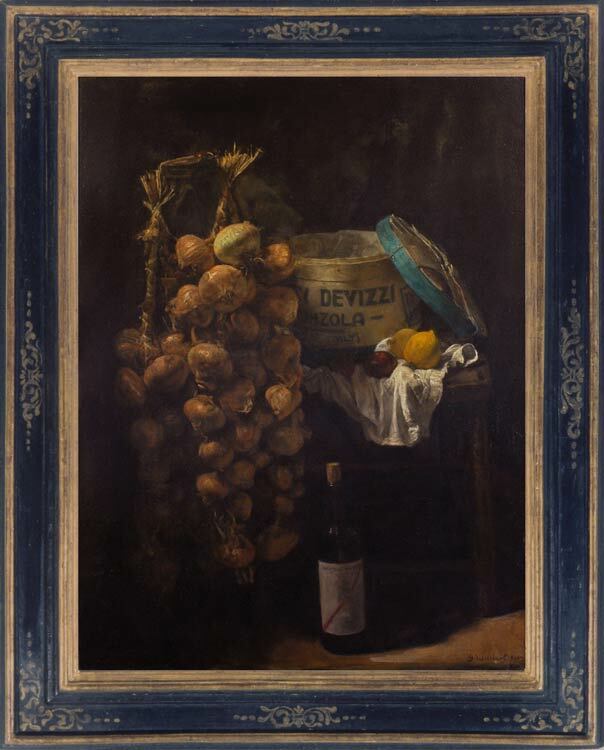 Note: The Devizzi family produced gorgonzola from 1889 to 1981; viridian green was discovered in 1797, but only used in oil paint from about 1840.